One of the world’s forgotten grain legumes, the bambara bean is native to West Africa where it is an important staple food, but one that inexplicably has lost ground to the upstart peanut. 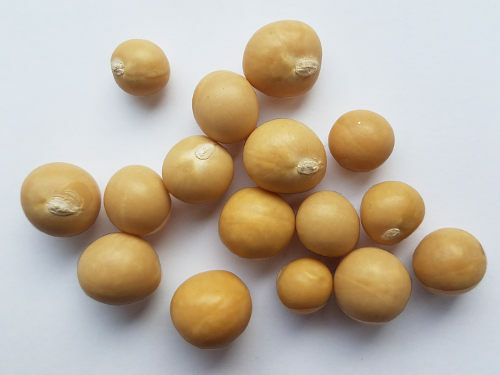 Like peanuts its flowers burrow into the soil to produce "groundnuts", but these groundnuts, or bambara beans, have a better carb-protein-oil profile than peanuts -- about 65% carbohydrates, 20% protein, and 6% oil. People can live on these beans almost exclusively since the protein is rich in methionine. The crop does well in hot dry areas and could become more important as global warming takes its toll. A low growing creeper, it does well in well-drained sandy soils, even soils too poor for other crops. The beans mature in 90 days and as to 150 days. They are soaked overnight and boiled until tender, and then are simmered with added sauteed onions, chile peppers, salt and spices. The fresh immature beans can also be boiled and eaten where the growing season is not long enough for the beans to mature fully. Traditionally the beans were given as ceremonial gifts but recently they have become a favourite of the affluent because of the nutritional value. Despite its obvious value as a crop, bambara was largely ignored by crop scientists and farmers still grow traditional landraces like this one, "Burkina", a large creamy-white form. Like many Third World food plants, bambara has medicinal uses also: the leaves are used for abscesses and the roots are used as an aphrodisiac.